Understand that even if you do not retain our services, all information you share with us is subject to attorney-client privilege. Let the lawyer ask questions. The lawyer will know what information is important in your case. The lawyer may offer options for your consideration. You may be asked to approve a retainer agreement and to arrange a retainer fee or deposit. As a general rule, you should not talk with anyone or sign anything until you have legal representation. 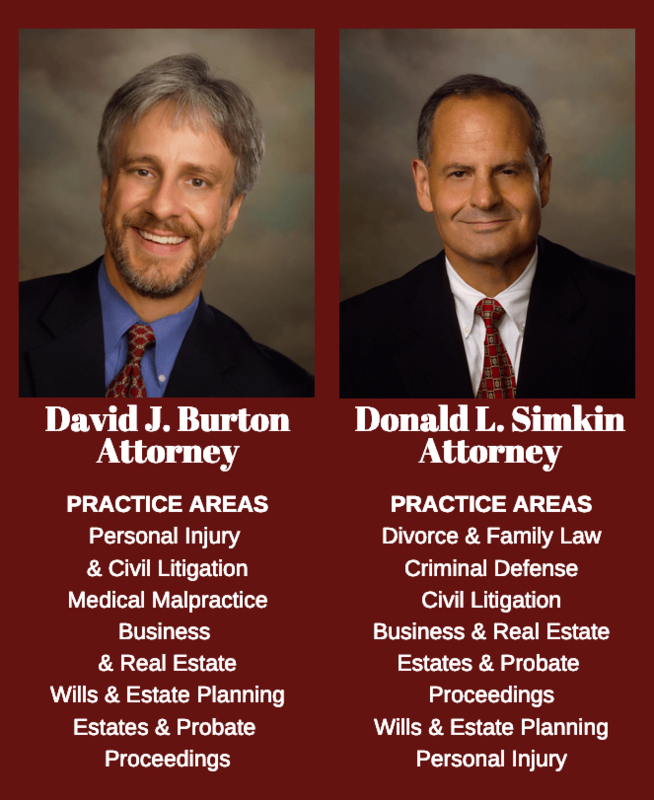 The Burton & Simkin legal team has decades of experience in defending persons charged with virtually every type of crime, from traffic violations and driving under the influence (DUI or DWI) to white collar crime and crimes of theft or violence. Our working relationship with the courts, prosecuting attorneys and other attorneys is excellent. Most important, we appreciate the fear and apprehension that anyone charged with a crime undergoes. We work hard to provide you with the best outcome possible. Is the lawyer experienced in the area of criminal law that relates to your troubles? How long has the lawyer been practicing in this area? Check out the lawyer's reputation and skills. Ask other lawyers. Ask friends and associates if they are familiar with the lawyer. Does the lawyer have a good relationship with the prosecuting attorneys and other lawyers in the area? Does the lawyer have a good reputation? Ask how many similar cases the firm has represented. Review the lawyer's biography and areas of practice on the firm's website. Visit the website of the state bar association, or call them, to assure the lawyer is in good standing. Is the lawyer conveniently located to assist you? Does the lawyer have strong ties to your community? How does the lawyer charge? Will the lawyer provide an estimate of the total fee, if possible? Does the lawyer seem to have an interest in representing you? Does the lawyer have the time and resources to give you the attention you require? Ask him or her. Has there been publicity about your lawyer's involvement in similar cases? Check out the local newspaper archives. Will the lawyer be handling your case personally?